What if you could walk into your college's library and borrow an ultra-mobile wireless computer? You could get your work done, and save it to the college's server. You no longer have to worry about your hard drive crashing. Best of all, you don't have to pay for it. It's just like borrowing a book from the library. Thanks to a project our IT department is championing, we're making it a reality at Peirce College. 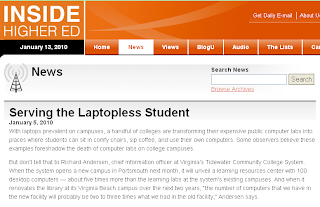 Word of the project reached the editors at Inside Higher Ed, who were working on a story about the laptopless student. I was honored to be asked to take some questions from the reporter. Take a minute and read the article to see what we discussed.